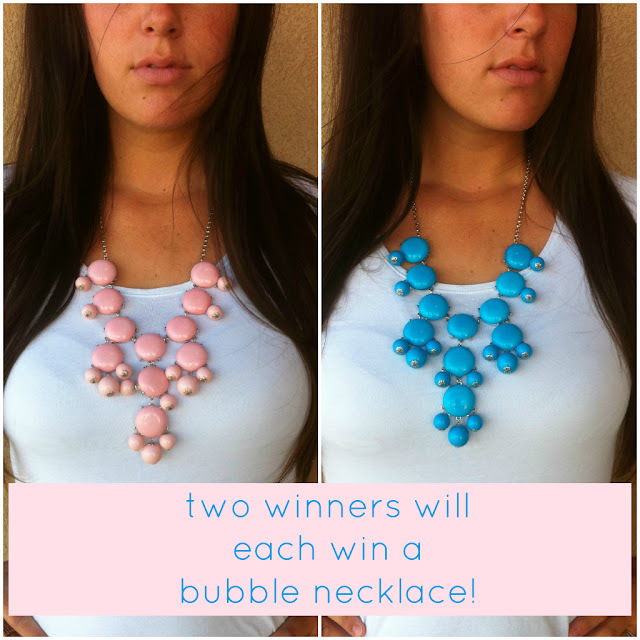 Three things that are near and dear to my heart: bubble necklaces & discounts/sales & supporting small businesses. Today's giveaway encompasses all three. Very Jane is a site that I frequent daily. It's free to sign up and I *love* seeing all the goodies that go through there on the CHEAP every day. VeryJane is like Groupon/Living Social for boutique goodies. Each day they have new deals and you can get them delivered right to your inbox! The site was founded in 2011 and already has a very active and fun community. You can stay up to date on new deals via email, Facebook, Twitter, Pinterest and Instagram! Today, Very Jane is offering TWO Oh, Sweet Joy! readers a bubble necklace. You stinking lucky ducks. I love the pale pink, but I also love the turquoise. I think I am torn. I can think of many outfits that both would match. LOVE these necklaces! I love the balue one! They're both lovely, but my preference is for the Pink. I would love the pink to match up with some grey outfits!! I would love the blue!! I love this necklace! I have been wanting one for so long. I hope I win one. i'd totally go with the blue! I adore the blue color!!! I love the blue!! These necklaces are amazing! Love love love the PALE PINK!!!!! love them both but I would choose the blue. I would love the Pink! I posted the apple cider recipe, which I want right now as I look outside my classroom window at the rain. Love the pink! Adorable necklaces! I would like blue necklace. Pink! I have two dresses that I recently bought that would look fabulous with the pink one! I love both, but I think I would go with pink! I love the pink one :) im a girly girl! Make sure to sign up for my Holiday Blog Swap!! I love they gray and the blue! All are so cute!! I LOVE Very Jane! I look at their site every day and usually have to talk myself out of buying every deal. Our bank account wouldn't be so thrilled. Love that they are offering this giveaway! Love! Thanks for the chance...both are beauties! I would totally pick the blue!!! I love Very Jane! I'm not usually a pink person but I'm going to go with the pink! And i just stumbled upon your blog because of meadow-rue!